…Give the detailed anatomy of human kidney with this exclusive medical image. This image contains the graphic of all parts present inside the human kidney. 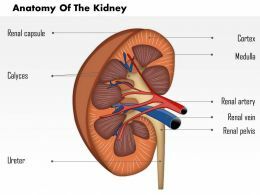 Parts like Cortex, Renal Capsule and Calyces are used to explain the function of human kidney. Use this image for kidney related presentations.